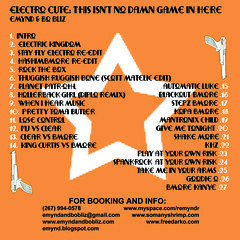 Well, Dave accidentally convinced me to post this on here by claiming elsewhere that “trendy dance musics penetrate.” Frankly, don’t know if I would exactly call this mixtape “trendy dance music,” but it is chock-full of electro/freestyle/bmore/dancehall/and-other-130bpm-goodness that will be sure to set your party off. 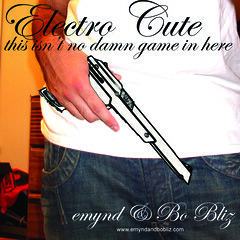 “Electro Cute” is the cleverly titled creation by two of Philly’s finest party DJs–emynd and Bo Bliz. The mixtape is a carefully crafted 70 minutes full of electro classics and rarities, focusing on Pretty Tony Butler and Baltimore Club Music. It’s got a trunkload of original blends that will melt your face and isn’t like anything you’ve ever heard before. It’s all fun and games… until it ain’t no game anymore.